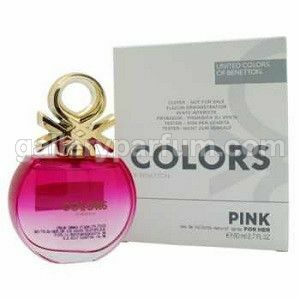 The two new fragrances from the house of Benetton within the Colors de Benetton collection are named Pink and Blue. Both editions are intended for women, presented by the campaign in a way that promotes "diversity, multiculturalism, beauty and optimism." The perfumes are made under the license of Puig as fresh and youthful creations. Both fragrances are available in round bottles with gold colored stoppers designed in the logo of the house as 80 ml Eau de Toilette. Colors de Benetton Pink was launched in 2016.